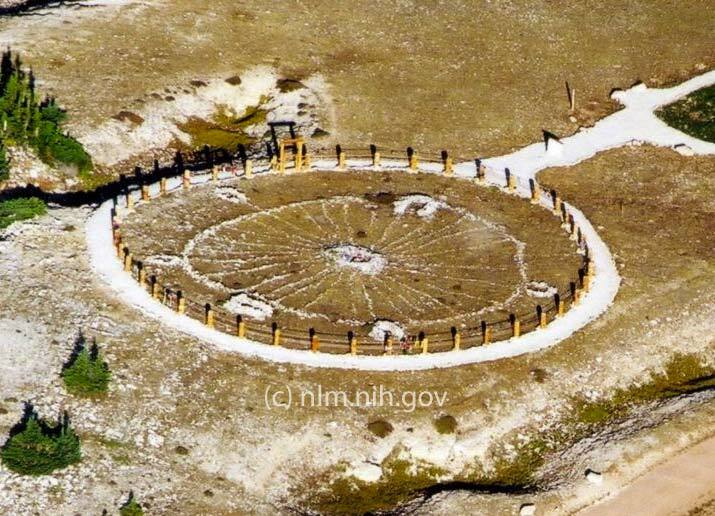 From the U.S. National Library of Medicine / National Institutes of Health comes this aerial image of the Bighorn Medicine Wheel in Wisconsin made many centuries ago from stones. I’m awestruck about this medicine wheel. That it survived all this time is amazing; that the placement of the lines and cairns purposefully align with significant astronomical landmarks is even more amazing. It feels very powerful and I hope to one day visit this site. On a shoulder of Medicine Mountain is the most famous medicine wheel in North America. 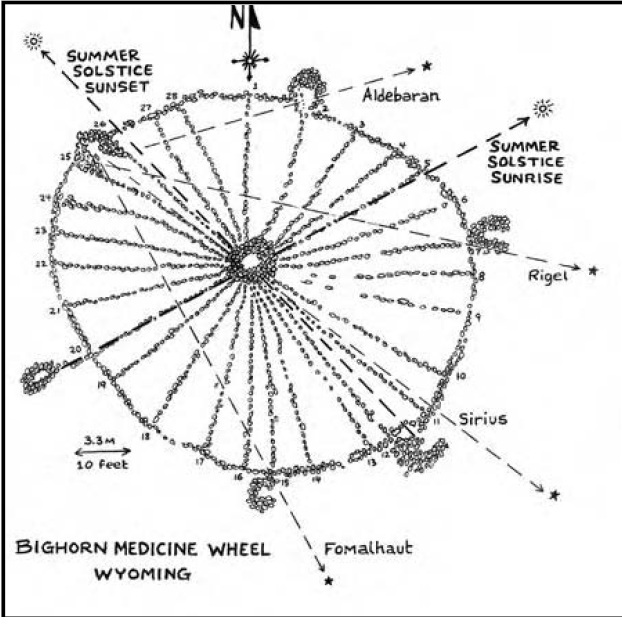 Described as a sort of American Stonehenge, Bighorn Medicine Wheel was famous with local native tribes as a location for sunrise and sunset rituals, as well as other celestial observations. This archaeological mystery and sacred native site is located high atop Medicine Mountain within Bighorn National Forest, 25 miles (40 km) east of Lovell, Wyoming. The medicine wheel consists of a collection of half-sunken stones in the shape of a wagon wheel. From the impressive elevation of 9,640 feet (2,892 m), the Bighorn Wheel alignments appear to link the distant plains with the heavens. The middle cairn (stone pile) is a meter tall with 28 uneven spokes radiating to an outer rim. The 28 spokes may represent the 28 days of the lunar cycle. Each spoke is about 36 feet (11 m) long, the outer ring is about 80 feet (24 m) in diameter and 245 feet (74 m) in circumference. Around the rim are 6 smaller cairns about a half meter tall and open on one side. The center cairn and another outside the rim establish an alignment with the rising sun on summer solstice, and one more measures the setting sun on the same day. The other cairns line up with the stars Sirius, Fomalhaut in the constellation Pisces, Rigel in the constellation Orion, and Aldebaran in the constellation Taurus. All these star readings fall within one month of the summer solstice.